How is environmental art playing out in other parts of the world? 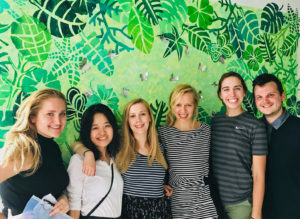 I was lucky to travel to China this last spring, accompanying OISE interns as they taught in five schools in Hangzhou, a city a few hours southwest of Shanghai. I was impressed with the strong presence for the arts everywhere we travelled, evident in part in the gardens, architecture, public sculpture, and design of public spaces. As part of my visits to these schools, I was able to visit a few art classes, and pleased to see ‘low impact’ art-making being taught, inspired by traditional Chinese art forms, like paper-cutting, watercolour, and calligraphy. While I would not consider these forms of eco-art – there was no overt attention to environmental learning – they were supportive of similar tenets. The watercolours we saw students painting were focused on plants and wildlife; the calligraphy uses natural ink made from charcoal. A few of the OISE interns also put their learning about eco-art into play. They turned students’ attention to learning about the plants and insect life in the school’s butterfly garden. 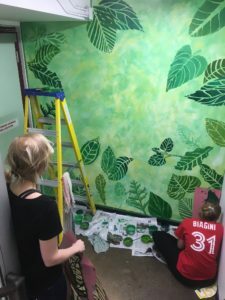 Drawing on their experiences working on the last few eco-art installations at OISE, they created a beautiful homage to these by combing our butterfly installation from last year with our stencilled plant mural from this year. I can’t wait to see what these teacher candidates – and our Chinese hosts – accomplish moving forward! I’m always looking for ways to extend my students’ learning about eco-art education, so in addition to collaboratively creating art installations, we also take this work into schools. I’ve shared some of these experiences previously, but wanted to write about the most recent one focused on water education at Ryerson Community School. 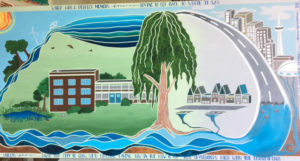 The teacher-researcher at this TDSB elementary school, Adrienne Rigler, has been immersed in water education over the past 5 years at different grade levels, often having her students share their learning about water with other classes. We framed this mural project as an arts-based component of the gr. 8s cross-curricular study about water. They learned about their local watershed, and explored the neighbourhood to ascertain its features, finding evidence of the local (and buried) Russell Creek. They photographed, analyzed, and sketched these watershed features, working collaboratively with myself, teacher, and teacher candidates to create a composition for the mural. We used a taping technique to delineate the main images, which proved to be a great way for the whole class (many of whom were hesitant to paint) to engage in the painting process. They saw the realities of their urban watershed on the right (over built, polluted water flowing into the sewers) and their dream for a healthier watershed on the left (lots of plants, animals, even a pond in their schoolyard). The result is above – what a beautiful way to share what they learned! It must be spring as a new eco-art installation is blooming at OISE! 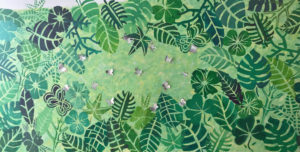 This year our art team wanted to raise awareness about the importance of native plant species – their central role in pollination, and their importance in providing healthy habitats for all living things. This was one of the ways we are trying to bring engagement with our Community Learning Garden inside the building to inspire year-round teaching and learning in relation to the power of gardens. 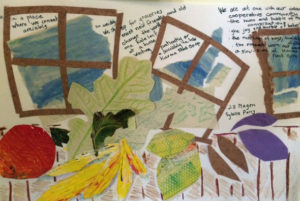 Our Learning Garden is composed of six small gardens that focus on themes important to our institution, from equity and inclusion, to Indigenous Ed, to Environmental learning – it is unique in its attempt to manifest educational theory in plantings. 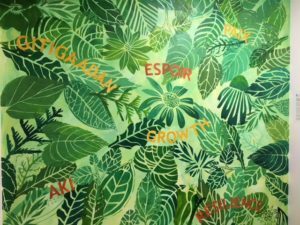 Inspired by a great summer of growing in 2017, we asked graduate students to create large scale stencils of the leaves and flowers of the 30+ native plants in this garden as a way to learn more about them. Making each stencil required careful observation and study of a specific plant – for many of these budding artists this will be the start of a special relationship with that species. 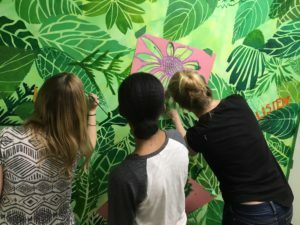 Then a small and dedicated team of students spent two days using the stencils to create a large mural about the garden, developing their artistic skills along the way, and learning how to minimize the environmental footprint of mural painting. By the number of hours they spent, they were fully immersed in the creative process and the camaraderie of working together towards a common artistic goal. The text, in English, French and Anishinaabemowin, was suggested by the collaborating artists to honour their languages, and reflect the deeper meaning that the garden holds for them. Here’s a photo of the completed mural. I’ve started playing with a new printmaking technique that has possibilities for low impact, biodegradable art-making. Gelli printing is an approach to monoprinting that creates one-of-a-kind prints. It utilizes a flexible printing matrix (or base) made out of natural materials – you can either buy one of these, or make your own using Knox gelatin powder and glycerin (the latter a less expensive option.) Due to its flexibility, it can capture both positive and negative impressions of items layed on the matrix. Laying down natural items like leaves, grasses, or ferns works beautifully, whether you lay down a base of pigment first, or after the item has gone on the matrix. This can be a great way to capture the experience of a nature walk. I like the effects of acrylic paint with this technique, rather than water-based print making inks, but as these aren’t particularly environmentally-friendly, I need to experiment with creating a more natural form of pigment with it. Check out all of the images on Pinterest that artists have posted for Gelli printing – hopefully it will inspire you to try it yourself! We were lucky to bring in David Sobel from Antioch University to OISE this past summer to do a talk and day-long workshop on place-based education. David is the guru of Place-Based Education (PBE), having written extensively about it in his many books (looking to Mapmaking with Children, Childhood & Nature, or Place-Based Education, to name only a few). 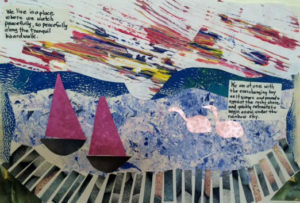 Working with his partner, Jen Kramer, David led our teachers through a variety of art-based learning activities based on creative mapping, collages, and miniature worlds. Our teachers would be the first to tell you that they aren’t ‘artists” or ‘creative’, yet all were fully engaged in these experiences as David and Jen had us consider the places in which we grew up, and the places we live in now as a starting point to thinking about PBE. David’s rich set of examples of PBE, drawn from schools all over the US, inspired us with its ‘real world’ learning that can take place when using this approach – creating museum exhibits, cleaning up wetlands as just two examples. 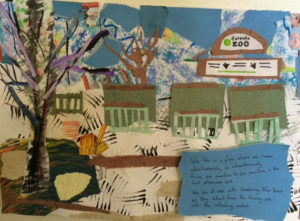 In Jen’s afternoon workshop, the teachers created beautiful collages using discarded artworks of key parts of Toronto, inspired by author’s book; a few examples are shared below. We ended the day feeling better prepared to tackle PBE theoretically, practically, and aesthetically! 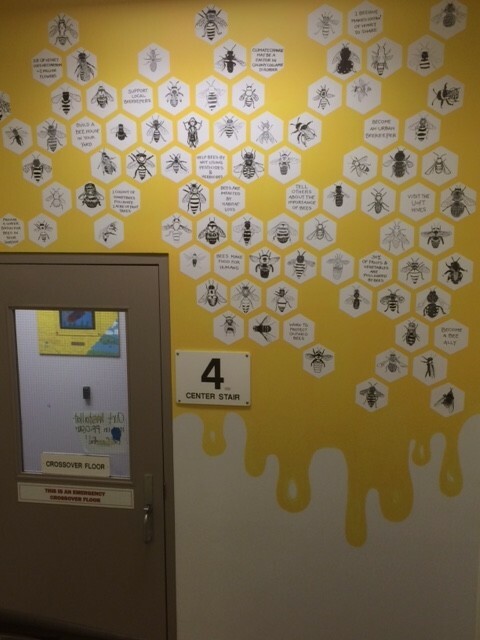 OISE is abuzz with our new bee installation.We completed it this last week, and we think the results are sweet! 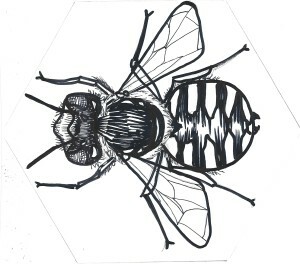 As reported in an earlier post, we’ve been working to raise awareness about the plight of bees. In Ontario, like other places around the world, we depend on bee pollination to cultivate a third of our plant-based foods – without bees, our complex ecosystem and food systems would be radically changed for the worse. Our bee populations have been declining rapidly, more so than in other places. 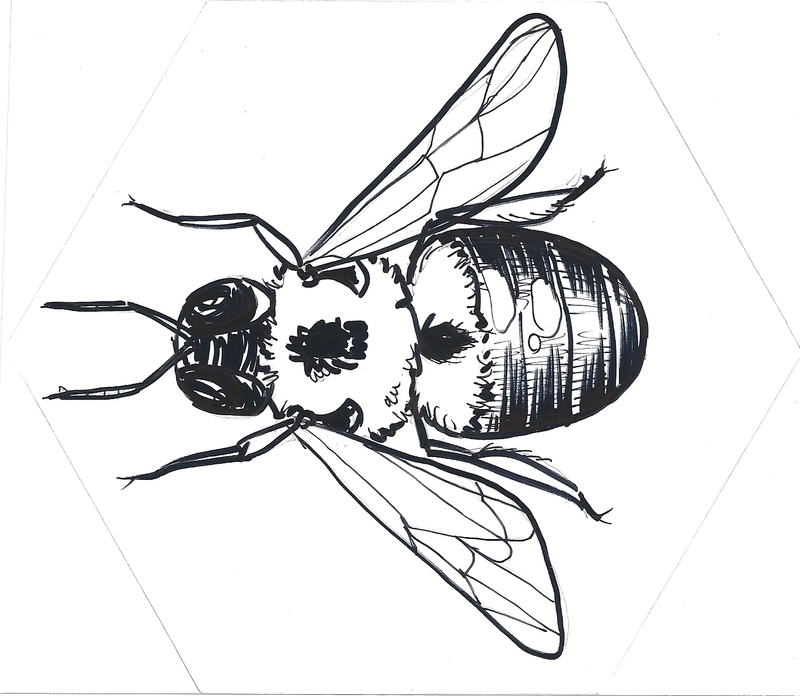 This is being referred to as Colony Collapse Disorder; many believe the causes of CCD are habitat loss, climate change, neonicotinoids (a type of insecticide), Varroa mites, and Nosema (a fungal digestive disease). There are over 70 Ontario bees depicted in the installation, each been hand drawn by a member of the OISE community onto an adhesive material made from 100% recycled plastic. 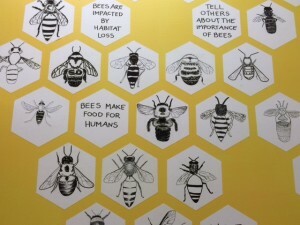 We interspersed these images with facts about bees and actions viewers can take to help counter CCD. The work, like many of the others we have created, in positioned as part of the ‘Take the Stairs’ Campaign, a walking art gallery that encourages our community to take the stairs rather than elevators (saving energy and improving health and wellness of the walkers). 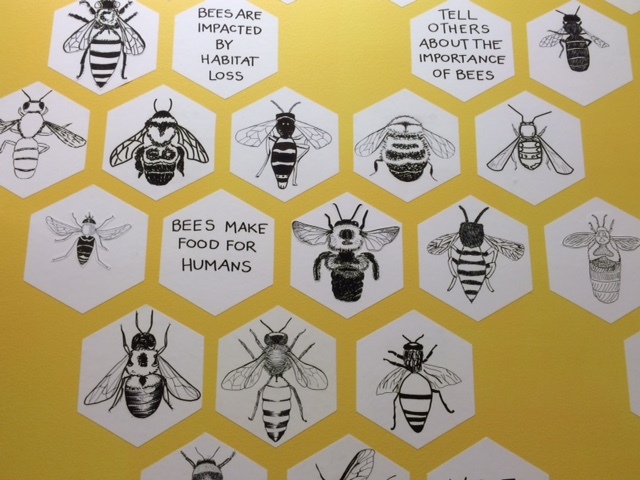 A few photos of the installation are below – we think it looks ‘beeautiful’! 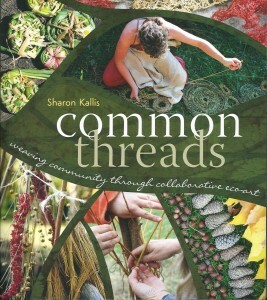 How do you help elementary students understand the importance of biodiversity? I’ve been invited to work at a local elementary school in the spring with students in classes from grades 1 to 8, working on developing their knowledge of this complex concept through a series of murals for the school. But where do you start with a ‘big idea’ like this? I began by talking with the teachers leading the project to get an idea of what they wanted; there were parameters for how they could proceed already in place. Then I did some brainstorming of words, images and text for my own reference points. Researching was the next step; I read about and watched videos on biodiversity and looked at other artists’ works to see what has been done in the past. All of this led to developing ideas on paper, which were revised by talking with the teachers. 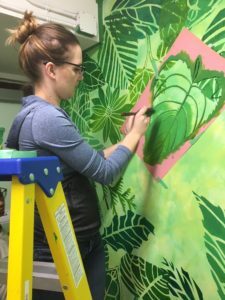 We have considered how to lesson the environmental impact of the murals along with this; we’re re-purposing existing panels, rather than buying new, and planning to capture all of the waste water from our acrylic paints. The planning process has been bringing together aspects of art, science and geography, and drawing on the principles of creativity and design thinking. Check back in June to see how the project has developed; I’ll post our next steps and photos of the finished murals. With the start of a new academic year comes the beginning of a new Eco-art project at OISE, one of my favourite parts of the year. 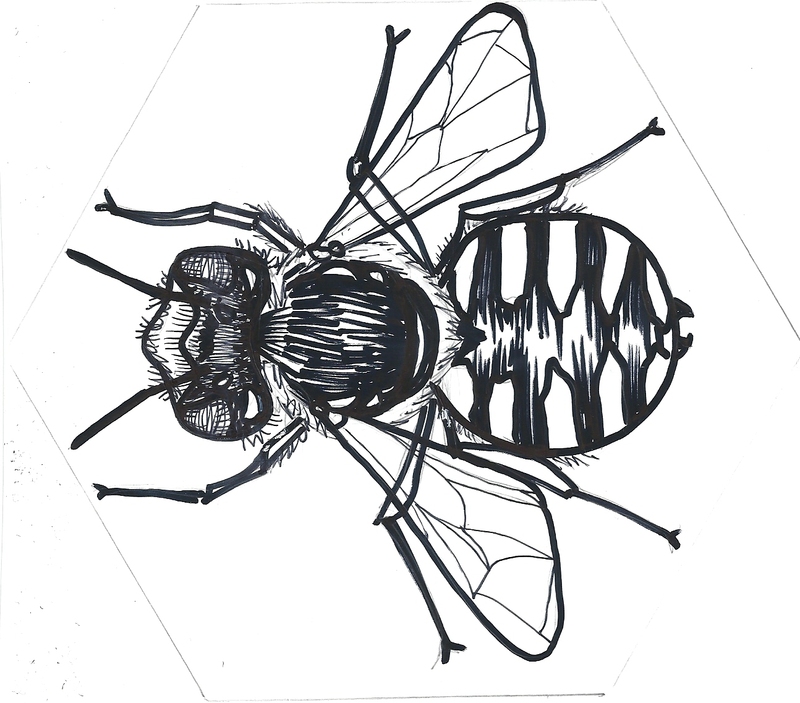 Last year we focused on birds (via the FLAP installation), so we thought it made sense to follow up with one on bees (so we’ll have the ‘birds and the bees’ in our walking art gallery!) The plight of bees is being well-covered in the general media these days – bee populations are declining rapidly, due in part to the use of new pesticides like neonicotinoids, loss of habitat, and climate change. As bees are responsible for pollinating about 30% of our plant-based food crops, this puts our own food supply at risk – a good reminder that everything is connected. 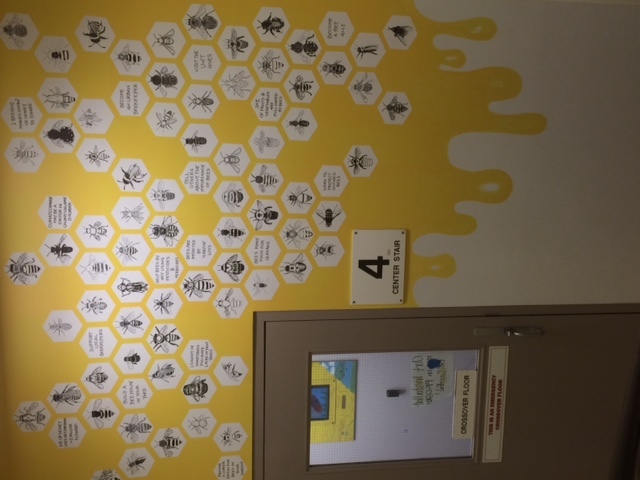 So our next art installation is creating a ‘hive’ of line drawings of Ontario bees, combined with text about their importance; this is helping my students to learn more about bees and the challenges they face. 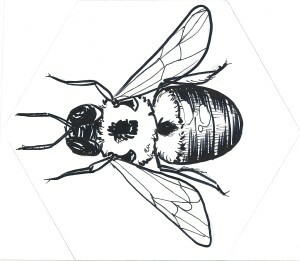 I have attached a few photos of some of the first drawings…check back here for photos of the full installation in April! This page took 0.371 seconds to load.